Arsenic at the High School! 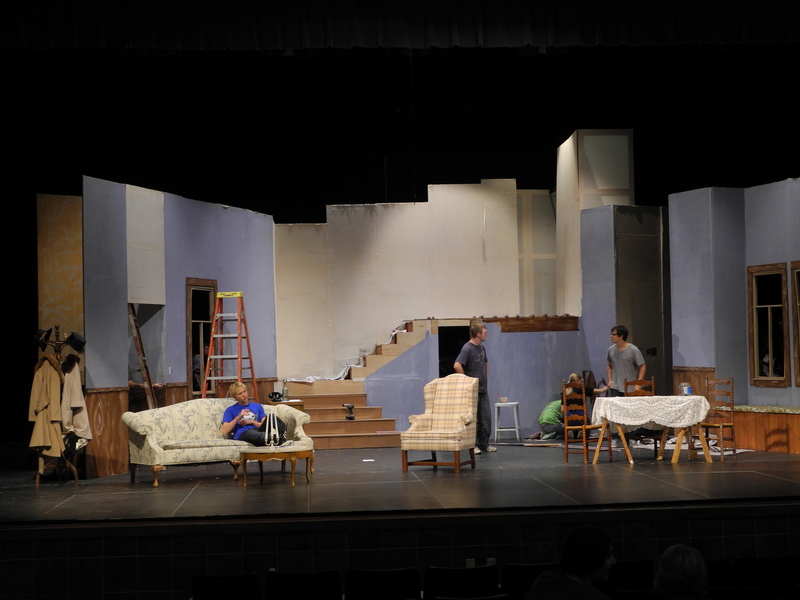 The set crew is scurrying like ants in a shaken ant farm, the light crew is reprogramming a missed cue and the sound crew is busy counting–“test 1, 2, 3, 1, 2.” It’s tech week at the Evansville High School as the Drama Department prepares for its production of Arsenic and Old Lace. 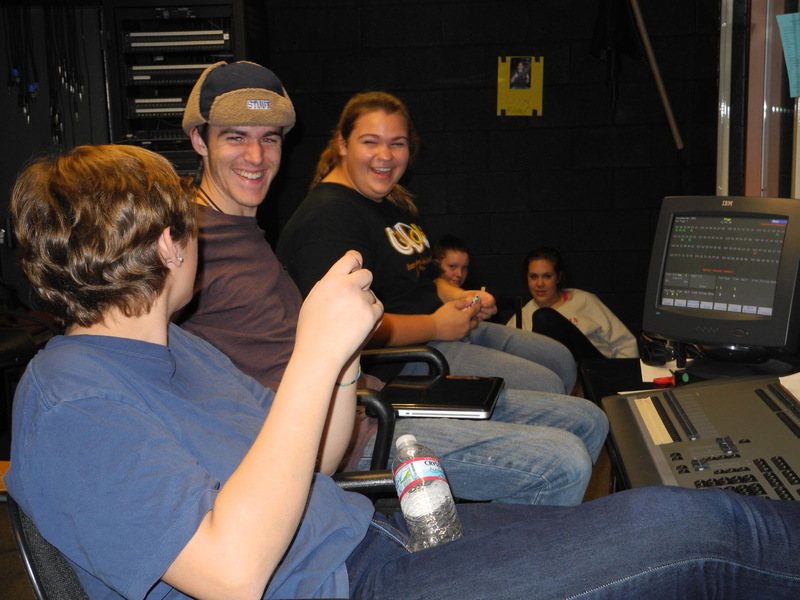 After classes let out the techies and actors descend on the Performing Arts Center and get in a few hours of work. At 4:30 the parents who have donated food for the tech week meals have made their deliveries and everyone eats. Then it’s back to work and maybe even squeeze in some studying for tomorrow’s history test. Long nights lead to tired kids who continue the mad dash to opening night. Make sure to attend the show, this weekend, Friday and Saturday night and Sunday afternoon at the Performing Arts Center at the Evansville High School. When I was growing up, my father watched All-Star Wrestling on television. It was the sixties after all, and the featured wrestlers were The Crusher, Mad Dog Vashon,Vern Gagne, and of course the “Very Capable Kenny Jay.” Kenny was sent out to do a reputable job of wrestling –he had no gimmick, wrestled by the rules, made the matches last, but in the end his wins were few and far between. 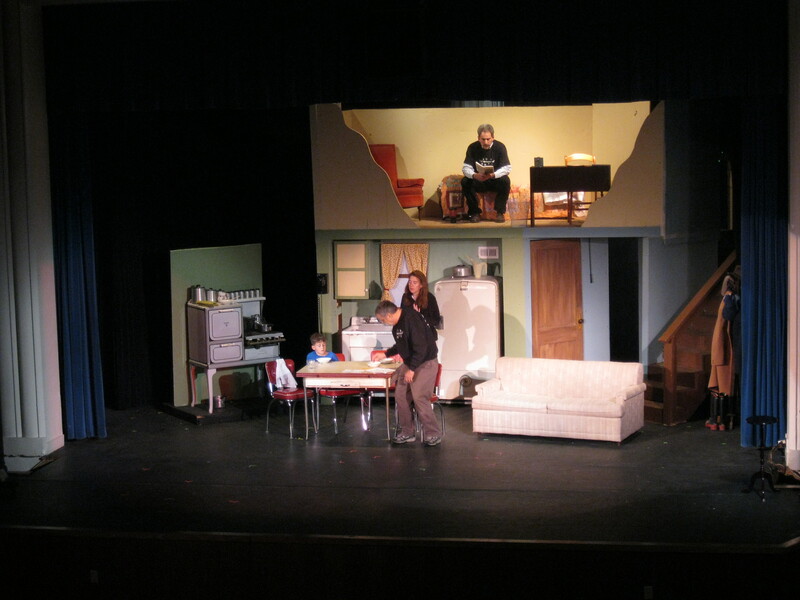 ECT has always done its smaller productions in the J. C. McKenna Middle School Auditorium. 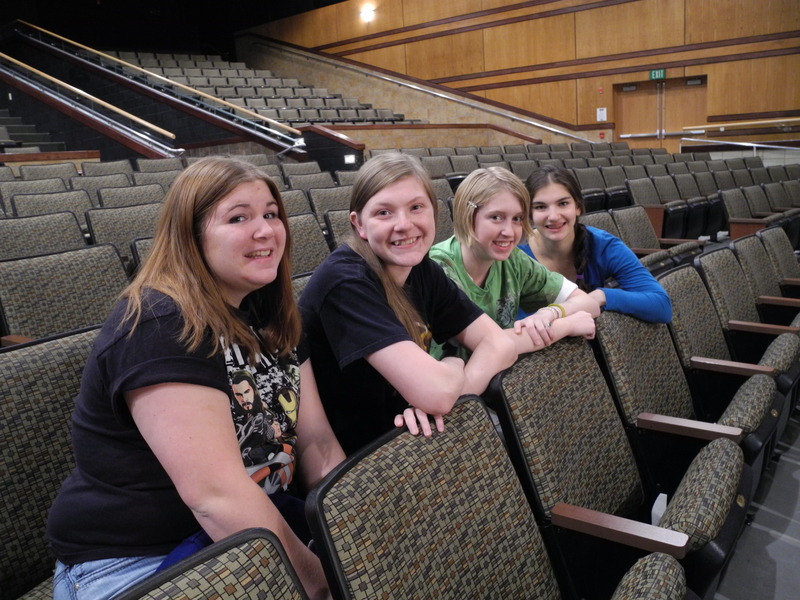 The auditorium is almost always available during the school year. Our 2010 and 2011 productions of A Christmas Story were done on that stage, and we had planned to do our upcoming 2012 production there, too. Our musicals, on the other hand, are produced in the summer when the Evansville Performing Arts Center, at Evansville High School, is available. 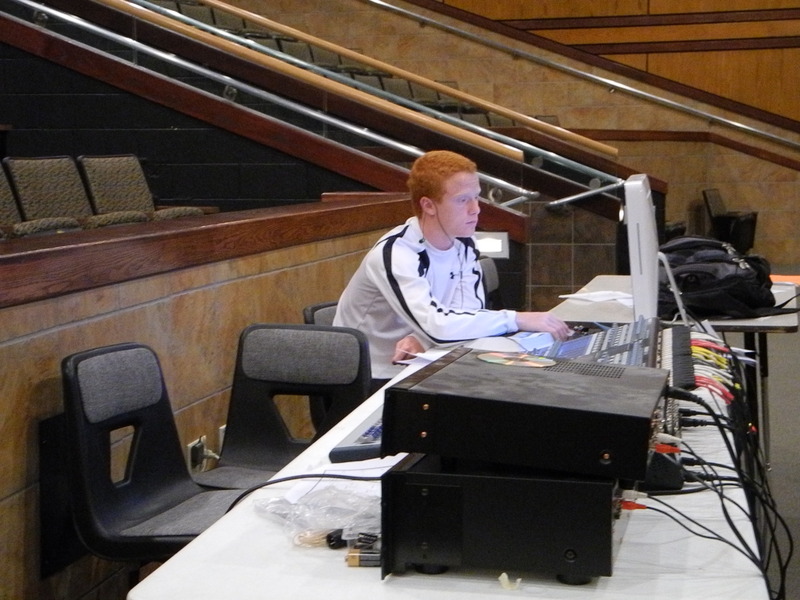 The Middle School Auditorium, like Kenny Jay, is also very capable, but it has its challenges. The stage doesn’t have wings on the sides, which makes it difficult to bring set pieces on and off stage. There’s plenty of room behind the stage, but the lack of wings requires a set designer to think about things like how to get a car on and off the stage. 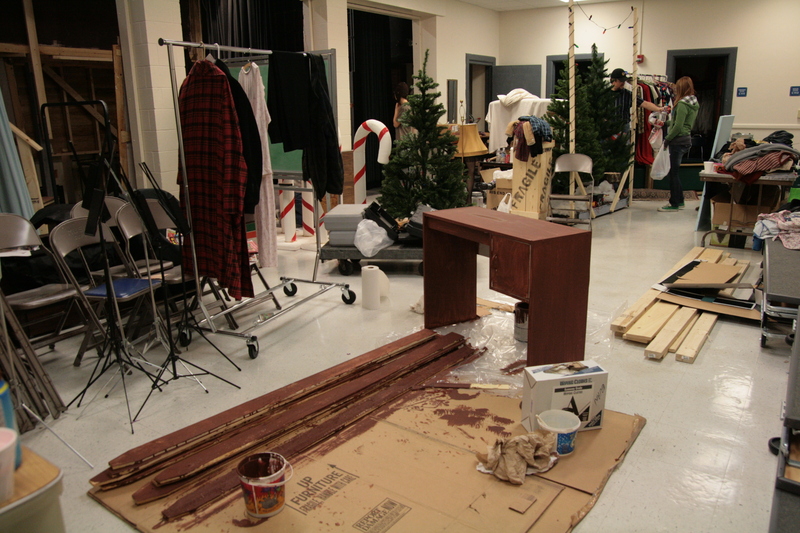 The actors are also forced to negotiate their way around the set pieces when they’re not on stage because the back-stage area also doubles as the green room. 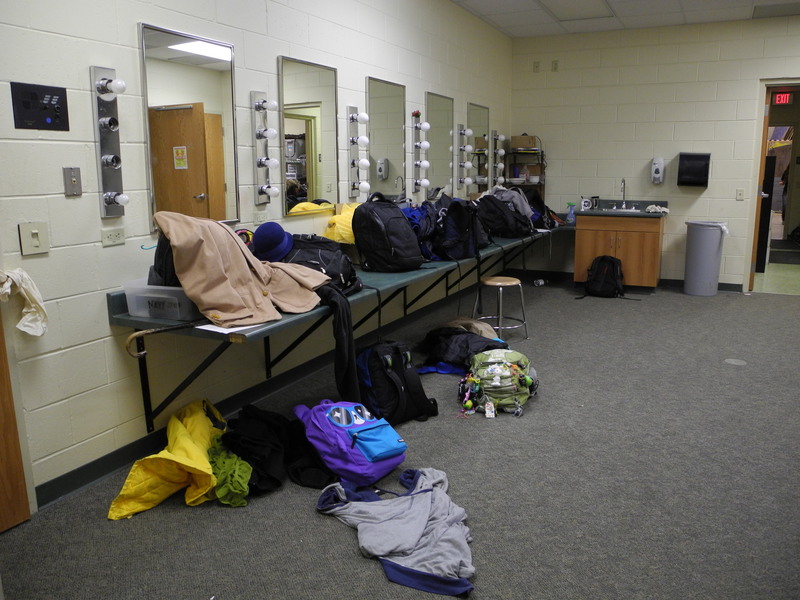 The Middle School “green room.” How many more loads!? The sound system is designed for basic amplification–plug in a microphone, adjust the volume, and let the speech begin. It too is very capable: a sound novice with a computer and a direct interface box can make sound effects happen, a good sound guy with a mixing board can take the system to its limits. But there are limits. The light system, oh the light system, is old and infirm. A few years ago, a couple of us opened up the covers on the dimmers (boxes that look like old stereo amplifiers), which are the brains of the light system. Then, with a combination of a vacuum cleaner and several cans of air, we blew out and sucked up a decade of dust. That kind of dust build-up, along with faulty grounds, caused lights to flicker unexpectedly during productions. But even after an electrician went through and fixed a few grounds, it’s still always an adventure when you flip on the lights. Sometimes it takes two or three reboots and an hour of warm-up to get the ghosts out of the system. The Evansville Performing Arts Center, or PAC, on the other hand, has generous wings, a modern and maintained light system, and a new digital sound board with wireless mics and multiple speakers. It’s beautiful, with or without anything on the stage. So, it was worth the time and effort to pursue that venue this year for our production of A Christmas Story. The show is moving to the PAC! Scheduling issues will add some challenges to our production, but those are worth it for the opportunity to perform on Evansville’s big stage. As it turns out, in doing the obligatory three minutes of research for this, I found out that Kenny Jay was actually sent out to make other wrestlers look good. Not just by losing, but also by his ability to make his falls and take-downs look better than the wrestler who threw him down. The Middle School Auditorium is like that, too. When I see pictures and hear stories of the big musical productions that were done there in the past, I’m amazed. Not only were there set pieces and actors back in the green room, there was also a pit band! That Auditorium too did its job of making many an actor look good in its years of service to the thespians of Evansville. No doubt ECT will be back to the Middle School to do other productions. But I’m still happy we’re moving. The Production Team plans out the move to the PAC stage. I can’t believe we’re about to start the fifth week of rehearsal for A Christmas Story. The time goes fast, so it’s good that we’ve planned a long rehearsal schedule. I don’t know how “real” directors plan their rehearsals, but for the first month we’ve been working on what would appear to be random scenes. The scenes aren’t random, though. 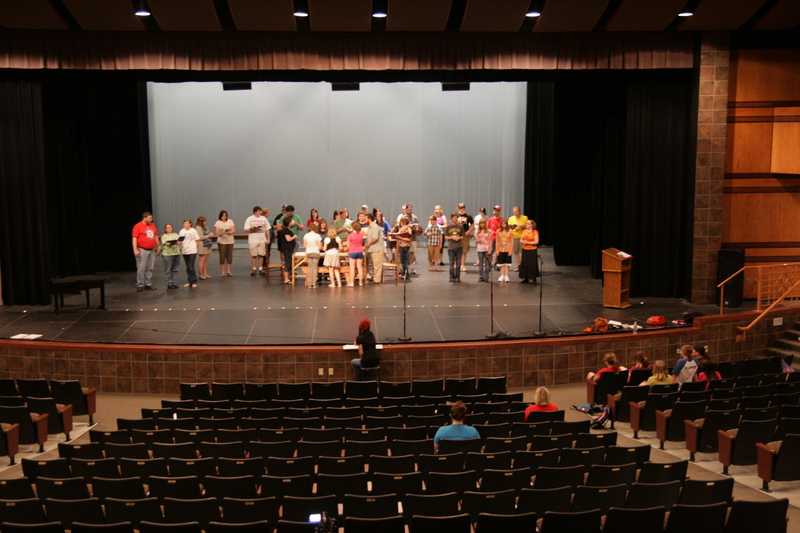 At the beginning, the actors received their first rehearsal schedule with a space for them to note any conflicts. That’s so I know who will attend and we can work on the scenes that will use the available actors. The reality is that community theatre is just another activity among football, soccer, teacher conferences, classes, and even other productions. Most of the first weeks have been spent working on the scenes with the kids. They, for the most part, are a new bunch. Two of them have acting experience but not with ECT, two of them have experience doing A Christmas Story, three of them haven’t been on stage before. From the outset, I knew they needed to mesh both on stage and off and, amazingly, they work well together. I’ve tried to foster that camaraderie. There’s a new position on our production team called Youth Actor Coordinators or YACs (as in “yaks”), as they have become known. They have become an integral and important part of our rehearsals. 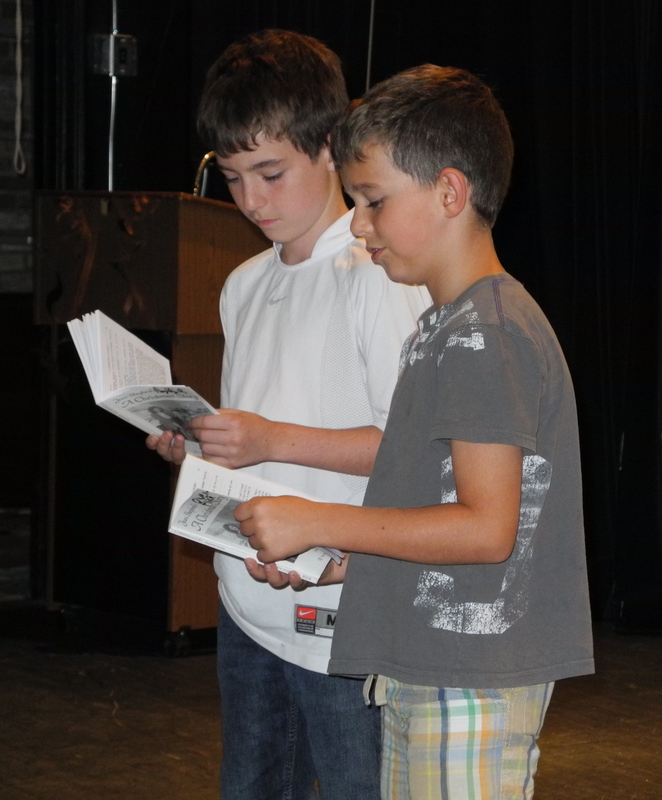 Their role is to work with the kids when they’re not on stage–running lines, playing games, and otherwise keeping them interested during those lulls between their scenes. Musicals involve lots of kids so we’ve always used “kid wranglers” to keep the teeming hordes together and ready, but this group is far too mature to need wrangling. They just need more time to work together. And the time they spend playing games and having fun in the back of the theater will reflect in their interaction on stage. Even at this point, as we work through the scenes with the kids, they are working as a team, joking with each other, and giving each other a friendly poke when they miss a cue. 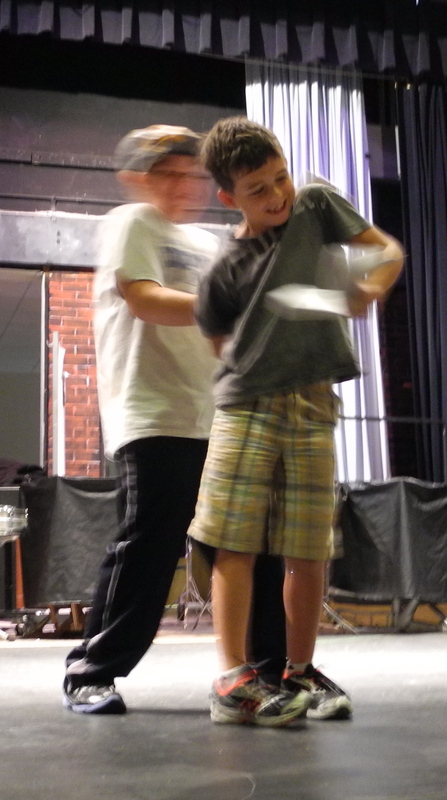 It’s fun to watch, and hopefully they’re having fun coming to rehearsal, too. In the end, it will benefit the audience as the off-stage chemistry among them will show, making their on-stage friendships seem genuine. 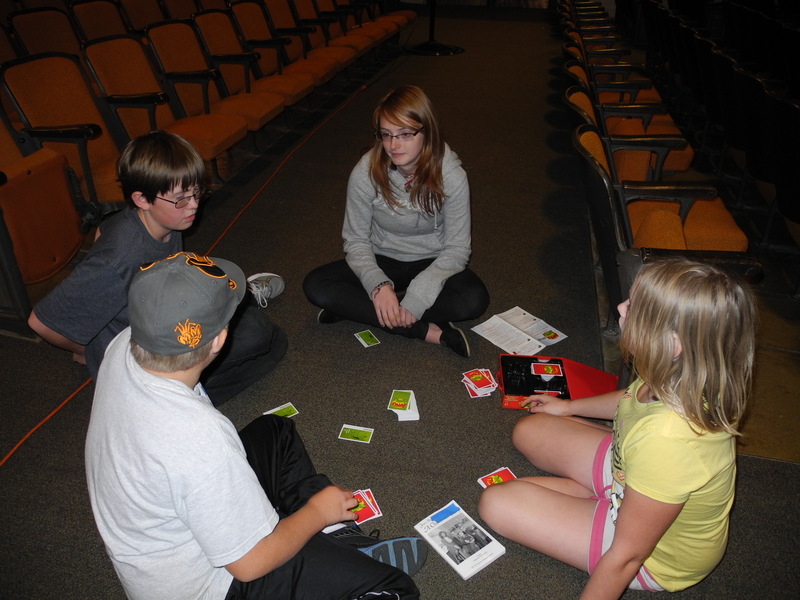 Ralphie, Scut, Esther Jane and Caity the YAC.